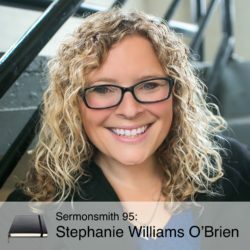 Stephanie is one of the founding lead pastors of Mill City Church in urban Minneapolis, Minnesota. She is also the Preaching and Ministry Communication professor at Bethel University and Seminary in St. Paul, Minnesota. Stephanie has opportunities to coach leaders around the country through speaking, coaching and her weekly podcast Lead Stories with her friend Jo Saxton. She is passionate about communities and individuals participating in the mission of God to the world. She is married to her husband, JD who is a filmmaker and they live in Northeast Minneapolis with their energetic dog, Chaco. Stephanie loves getting the chance to watch God move and tell the story at her blog: www.pastorsteph.com.